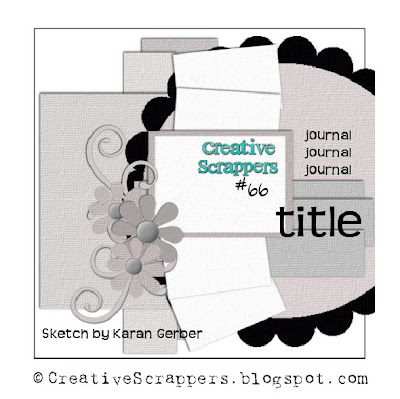 This is a great sketch by Creative Scrappers. These are pictures from a sister's weekend in 2006. For five of us to re-arrange our schedules was quite a feat. But how wonderful for all of us to get together! That was the last year we were all able to have a "full" sister's weekend with all 5 of us. I am hoping someday that we will have this precious time again, How special to shop, laugh, eat M&M's, and just be friends and sisters for a weekend. Oh, and to complete the recipe, 5 lovely girls. Can you tell I love my sisters very much? Brenda, this layout is fantastic! What better way to share that special bond between sisiters. Your take on the sketch is fabby, as always! LOVE this big yummy Bazzill flowers! ooo this layout is GORGEOUS!!! What a fantastic layout. Thanks so much for sharing!